The Natural History Museum of Utah is pleased to be open in our home, the Rio Tinto Center. Located in the foothills above Salt Lake City, the building is an accomplishment of the community and will serve to further the Museum's mission: to illuminate the natural world and the place of humans within it. Nestled into the foothills of the Wasatch Mountain Range, the Rio Tinto Center rests on a series of terraces that follow the contours of the hillside, blending into the environment. The building is located along the Bonneville Shoreline Trail, a popular location for hiking and mountain biking, which serves as the Museum's "main street". The building is immediately recognizable due to the 42,000 square feet of standing seam copper that wraps the exterior of the building. The copper, mined from Kennecott Utah Copper's Bingham Canyon Mine located across the Salt Lake Valley from the new Museum site, is installed in horizontal bands of various heights to represent the layered rock formations seen throughout Utah. Photos of the Rio Tinto Center are available on the Museum's Facebook page. These should be viewable whether or not you use Facebook. Go on an NHMU Highlights Tour! Visitors enter the Level 1 Foyer to purchase admission and register for events. From there, they climb the main staircase, or take an elevator, to emerge in the main lobby area, which we call the Canyon. Three-stories high and featuring a collections wall displaying more than 500 objects from the Museum's collection, the Canyon is our central public and gathering space. From the Canyon, visitors can enjoy spectacular views of the Salt Lake Valley, begin to explore the Museum's Trailhead to Utah system, enter the exhibit galleries, or enjoy the Museum Store and Cafe. Beyond the public areas of the Rio Tinto Center, the building provides advanced research and collection facilities for Museum scientists who oversee the care and curation of more than 1.5 million objects in the Museum's collection. The collections and research areas are the core of the institution and feature sophisticated climate control and other means of protecting the collection, and a venue for undergraduate and graduate training at the University of Utah. The building and surrounding grounds have been designed and built according to the standards for LEED (Leadership in Energy and Environmental Design) Gold Certification. From the pervious pavement of the parking lot to solar photovoltaic panels on the rooftops, the Museum worked with our architecture and construction teams to incorporate green elements throughout the design, construction, and operations of the building. Construction of the Rio Tinto Center is a result of a successful public/private partnership to raise the total cost of $102.5 million for the project. The funding came from the federal government, the Utah State Legislature, a bond supported by the voters of Salt Lake County, and over $44 million raised through individual, corporate and foundation philanthropic support. The Museum's building is named the Rio Tinto Center due to the naming-level donation from Kennecott Utah Copper / Rio Tinto which included the donation of the copper used in the building's facade. Located on 17-acres adjacent to Red Butte Garden, the Natural History Museum of Utah serves as the trailhead to Utah for residents and visitors alike. The site overlooks the Salt Lake Valley and is a part of the University of Utah's Research Park. 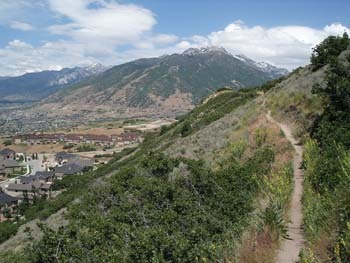 Access to the University of Utah portion of the Bonneville Shoreline Trail is, literally, outside the Museum's front doors. The Trail, popular with hikers and mountain bikers, serves as the Museum's main street, adding vitality and energy to all hours of our day. Museum visitors are encouraged to come prepared to explore the trail around the building, if you choose. Trail users are welcome to take a break at the Museum. We offer two water fountains for people and dogs during warm seasons along the trail -- one at the top of the south parking lot, the other near the Museum's front door. Visit the Museum Cafe for beverages, lunch and snacks from 9:00 a.m. through 4:00 p.m seven days per week. The cafe is open until 7:00 p.m. on Wednesdays. Restrooms are also accessible to trail users on Level 1 and 2. Bike racks are available in front of the Museum. The Cafe and restrooms are accessible without admission or checking in at the Ticketing Desk. We ask trail users to take caution when passing by the Museum's driveway and entrance during operating hours for pedestrian and automobile traffic, especially when riding bikes. Parking is available for trail users along Colorow Road, where trail access points have been provided and are maintained by the Museum. Please do not park in the Museum's parking unless you plan on visiting the building during your stay.